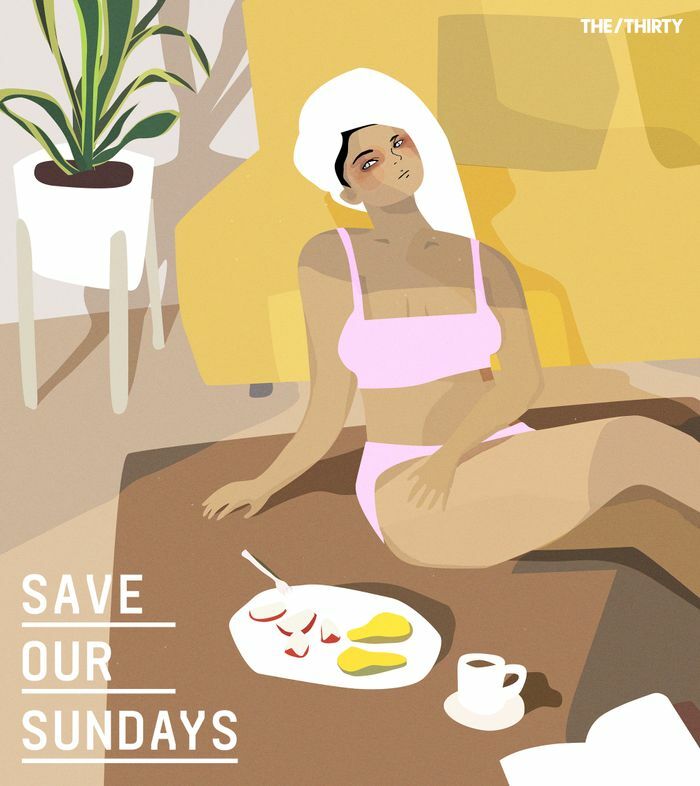 Welcome to our series #SaveOurSundays, where we tackle the Sunday Scaries and anxieties about the workweek head on. Check back every week to learn how to take back your weekend and start your Monday on a better note. It always starts in my stomach. A tightness that slowly escalates into a somersault—and then another and another. Often, my mind then starts to race through a to-do list that unfurls at a faster and faster clip until it's just a blur of "should" and "need to" and "don't forget." Other times, it's just the kind of inexplicable melancholy usually reserved for late summer sunsets and specific song lyrics. These are my Sunday Scaries, and we've gotten to know each other very well throughout my lifetime. Enough of us experience these pangs of anxiety for the Sunday Scaries to have earned a place in our cultural lexicon. It's a meme we all rally around, thumbing our Instagram feeds in bed as Monday looms. I'd even argue that we accept it as a simple truth of adulthood, like taxes and long lines at the DMV. While I don't experience the Sunday Scaries nearly as much as I used to, I've observed that no matter how much I love my job or dread the week ahead, I'm never totally immune to that telltale churning feeling. The truth is, science tells us not just that it's a very real phenomenon but that it's an avoidable one at that. "[The] Sunday Scaries is really just a form of anticipatory stress," says New York–based psychologist Heather Silvestri, Ph.D. She argues that while it's easy to fall into the trap of seeing the week as a series of chores, lessening that sense of trepidation might just come down to an attitude adjustment. Learn how to approach it below. The silver lining here is that your brain is simply trying to do its job. "The phenomenon of Sunday Scaries boils down to a preemptive fight-or-flight experience that signals our adrenal glands to flood our body with the stress hormones adrenaline and cortisol," says Silvestri. "When our psyche picks up on these signals, we begin to ruminate on all the reasons why this dread is gripping us. Now, a self-sustaining cycle has commenced in which we feel physiological stress, use our mind to provide the reasons for said dread, then feel more stress and off we go headlong into the Sunday Scaries." This, dear readers, is what we refer to as "spiraling." I brought up loving my job earlier because it's important to note that the reasons for this onset of anxiety might not always feel totally obvious. (In fact, as Silvestri notes, feeling like you shouldn't be anxious only perpetuates the spiral.) If you think about it, our culture has set us up to view weekends as playtime and weekdays to be more sanctimonious in ways that extend far beyond work. There are other errands to run, work-adjacent functions to attend, alarms to abide by, and workouts to log. On the flip side, says Silvestri, "we see ourselves potentially overcompensating on the weekends by drinking too much, playing too hard, accomplishing and thus savoring too little. The deck then is stacked against us when Sunday evening rolls up and we are having a serotonin crash and now realize the party is literally over. Contemplating a workweek of renewed deprivation and compensation is enough to send anyone into a very unpleasant state of dread." And even if the most hard-core thing you did all weekend was binge-watch The Walking Dead, a week of not lying around can be a tough pill to swallow. The solution, it turns out, might be scheduling some good old-fashioned self-care—on Sunday, sure, but also throughout your week. "Peppering your weekdays wherever you can with more ease and enjoyment is a great antidote for dreading them," says Silvestri. Schedule a juicy yoga class for Monday night so that you know in advance that you have a plan in place to unwind. Wednesday happy hour is a great outlet to blow off steam with some friends and break up the week. And if the notion of adding more plans to your busy schedule stresses you out even more, then that's cool too! Saying no is a very underrated act of self-care. The point is to turn this week-versus-weekend binary on its head so that even if you don't necessarily look forward to Tuesday as much as Saturday, it helps close the gap a little, tempering that fight-or-flight response in your brain. And since we tend to fixate on the more stressful components of our agenda, consider reminding yourself of all the good things you have to look forward to as well. In fact, write it down. "I also always encourage people to find as much intrinsic connection to their jobs and weekday tasks as possible," says Silvestri. "When we feel like we are active agents over our weekday lives, we tend to dread them less." That incessant mental checklist? Put it to bed by writing down a real one before kicking back for the weekend. "While 'to-do' lists can oppress as much as assist us, it's often helpful on Friday to jot down a brief list of tasks for Monday morning so that you commence your weekday experience feeling organized and purposeful," says Silvestri. Sunday you will thank Friday you. This is the time to be proactive about all the rituals that make you feel calm and content. "Being purposeful about injecting relaxation and reward into your Sundays can go a long way toward heading off the negative effect and anxiety that can accrue by the end of the weekend," says Silvestri. "When it comes to sidestepping the Sunday Scaries, all the usual soothing and centering strategies apply: meditating, moderate exercise, yoga, and journaling." In my experience, it also helps to not dread the Scaries themselves—anticipating the anxiety seems to only make it arrive sooner. Instead, should the stomach pangs begin, take the time to acknowledge and show compassion for your feelings. You'd be surprised: Sometimes merely accepting that you're stressed and/or sad the weekend is over is enough to chase the feeling away. Next up: These morning stretches are more energizing than a shot of espresso.